Are you looking to start the new year off right? Come on over to the library for a free jazz concert that's guaranteed to "knock your socks off". This "free" event is open to all ages. Seating is "first come, first serve". The trio has a great repertoire lined up. You don't want to miss this one. It's hard to find a better combination than New Orleans cuisine and mellow trio jazz. to enjoy cajun cookin' and stratight-ahead jazz with Dave. Lots of garage, lot and street parking. Come early for a good seat by the stage. Free concert with Dave's trio. Ben Stolorow on electric keyboard. Ollie Dudek on upright bass. Lot's of bar and table space and the atmosphere is always cool and mellow. See you at the Holiday! The Hardbop Quinter rides again. Come on out to Cafe Van Kleef and join the festivities. Never a dull moment, especially when it comes to Dave's Band. Three sets of smokin', hot-buttered jazz. Lots of parking in the area. Dave's Quintet will be in top form for this gig. Lots of street and garage parking. Straight-ahead hard bop jazz at its best. Plenty of street, garage and lot parking nearby. A very lively, funky, exuberant atmosphere! Looking for that perfect place to bring your "best friend", "lover", "wife", "significant other" or "insignificant other" on Valentine's Day? The Elite Cafe has it all, including amazing atmosphere, fantastic cajun cuisine, open seating or private booths and last but not least, some great trio jazz as played by Dave's band. Give yourself some extra time, because once you're there you won't want to leave! See you on Valentine's Day at the Elite! Dave's trio will be presenting an hour long introduction to jazz music, primarily for elementary and middle school children. The program will include performing some great jazz standards, as well as talking about each of the trios' instruments, demonstrating how they are played and showing what role each instrument plays in the jazz band. Admission for general public is $10. CVSOM members and family get in for $5. Bring the whole family out to enjoy food, beverage and the fantastic sounds of Dave's trio. Multi-level garage parking in the hotel. Dave's trio will be performing in concert at the school. compositions that include a wide variety of tempos, rhythms, meter and keys. General Admission is $10. CVSOM members and family get in for $5. No admission or cover to catch the trio and enjoy some high level jazz. Great band for this gig. The "dynamic duo" will be holding court at The Elite. Great tunes served up by Dave on trumpet and flugelhorn with Ben Stolorow on keyboard. Lots of street parking in the immediate area. Eat at an open table or in one of the private booths! Bring the whole family to this free concert at the library. Great modern jazz played by Dave's trio. Doors open at 2:30 pm for early seating. See you there for some fantastic "trio" jazz! Dave's trio will be playing some fantastic jazz for your listening and dining enjoyment. Great drinks from the bar. The trio will be covering a lot of ground, talking about and demonstrating their instruments,and showing what role each instrument plays in the jazz band. They will be playing a lot of cool jazz tunes, too. This if a free event. Come early for a good seat! Scott Sorkin on electric guitar. Dave on trumpet and flugelhorn with Ben Stolorow on keyboard. Come out to The Elite Cafe and enjoy the scene. There will be lots of very cool people and the music will be "happening"! Trio jazz at its best. Stop by for two hours of straight-ahead jazz sounds. Multi-level parking in the hotel garage. Lots of bar and table space. The trio will be doing an educational jazz show for children at the elementary and middle school levels. The performance will include talk about, and demonstrations of the instruments, as well as explaining the role that each instrument plays in the jazz band. There will be a lot of great basic jazz tunes played. The trio will be doing three sets. Free Admission for this concert. The trio will have some great compositions to play for your listening enjoyment. Open seating, so come early for a good seat. Dave's trio returns to the San Lorenzo Library for an encore performance. This free concert is open to all ages. Young children are welcome but please help them to remain quiet. Doors open for open seating at 2:30 pm. Straight-ahead, trio jazz at its best. No admission to hear this "happening" band. They'll be out on the deck, just off the main reading room. If there's rain, look for them in the main reading room. Steve Carter on electric keyboard. Danny Gerz on upright bass. Lot of table space and room for the kids to run around. The band has some great tunes ready to go. Basically for elementary and middle school kids but all are welcome. The Hardbop Quintet will be pulling out all the stops for this one! Three full sets of straight-ahead jazz. Plenty of parking in the immediate area. The trio will be in top form for their gig at this classy San Jose five star restaurant. Come and enjoy the view. Come and enjoy the cuisine. Come and enjoy the libation. Come and enjoy the amazing jazz with Dave's trio. Make it a point to attend this free concert by Dave's trio. They will have some great compositions ready to go for you. This event is "open seating" so come early to get up close and personal with the band. Dave's trio is playing in the big community room. Seniors will be having lunch during the concert, and the general public is welcome. The trio will be doing three full sets of "straight-ahead" jazz. Children are welcome so bring the whole family. Get to the library early! Seating is on a first-come-first serve basis for this "free" performance by Dave's trio. They will be playing a great mix of tunes reflecting some of the most creative compositions of the 50's and 60's, a "renaissance" period in jazz music. Ben Stolorow on electric key'bd. Ollie is one of the "first-call"
jazz bassists in San Francisco. Open seating in the children's room. Dave's trio will be holding court out on the deck. 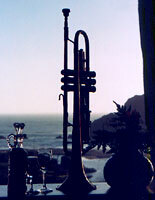 Live jazz, great food and an ocean view all at the same time. The trio will be performing an educational jazz show for kids,from pre-school on up. Parents are welcome too, for this free event. Bring your child to the show to learn some of the basics about jazz improvisation and some of the instruments used to play the music. Dave on trumpet (with mutes). Brad Buethe on electric guitar. Adam Gay on upright bass. Back for a return engagement, the trio will be performing a brand new repertoire of amazing compositions. Doors will open for this free concert at 1:30 pm. Seating is on a first-come-first-serve basis. Children are welcome but please help the little ones to stay quiet during the show. Kids of all ages are welcome to come to the educational jazz show. This free event will include verbal presentations and demonstrations of some of the instruments used in a jazz band,as well as the trio performing some great jazz tunes. Parents are welcome to stay for the show. We're on the rooftop section of Scott's restaurant. So cool watching the big jet airliners fly directly overhead on their final approach to San Jose's Intl. airport. Hopefully not too much of that during the bass solo! Come by for a listen (to us, that is). Three full sets of hard-hitting Be-bop jazz. The trio will be performing an hour-long "introduction to jazz" show for kids. This is open for pre-schoolers on up. Parents are encouraged to attend the performance, too. Doors will open at 6:30 pm for this free event. Come early for a good seat. Young children are welcome but please help them to remain quiet during the performance. The trio has some great jazz compositions ready to play for this one. The Hardbop Quintet will be the opening act, outdoors and onstage, to help celebrate downtown Oakland with a night of "live" and "DJ" music. Stop by this "free" event and dig some funky, straight-ahead jazz by the hardest working band in the Bay Area. The trio is returning to the Terrace Room for three great sets. No cover or admission charge. The trio will be performing an hour-long free concert in the Atrium of the Medical Center's main building. This is open to patients, staff and visitors to the Center. Plenty of seating in the Atrium area. The trio will be performing outside in the plaza area. Come early to get a good seat for this free concert. Come one and all to the Foster City Library to hear about jazz music. Come early to get a good seat at this free event. Dave's band will be playing some amazing jazz at the Cigar Bar. The Hardbop Quintet will be pouring it on. The trio is happy to be part of the festivities for the Willow Glen Library's 10th Anniversary party. They will be performing an hour long concert in the patio area. There's a lot going on at the library that day, so the parking lot could be full. Street parking is close by. Please check the library's website for more info. seafood (or regular American cuisine). Dave's trio is on the roof garden playing three great sets of straight-ahead jazz. Ample parking in the garage right under the restaurant. Spend your Sunday afternoon out on the deck at Sam's. Enjoy the ocean view, smell the salt water in the air, taste the amazing seafood that Sam's offers, and listen to the fantastic sounds of Dave's quartet. No cover charge. Plenty of free parking in Sam's big lot. The "Hardbop Quintet" will be ready to pour it on! Three full sets of hard-driving, straight-ahead jazz. Come early for a table close to he bandstand. Dave's trio will be playing some great modern jazz at this very hip and stylish restaurant. The live jazz starts at 6:30 pm and will include three full sets. Children are welcome so bring the whole family! Dave's trio will be putting on a free one-hour show for kids. It's an introduction to jazz, and will cover improvisation, how the instruments in the trio are played, and what role each instrument plays in the jazz band. The show is geared towards pre-schoolers, elementary, and middle school children. Parents are also invited to attend with their kids. Scott's Restaurant is up on the 6th floor with some great views of San Jose and beyond. The music will be phenomenal. Dave's trio will play some fantastic straight-ahead jazz for your listening and dining enjoyment. See you at Scott's Seafood for a night to be remembered. Plenty of table and bar space with ample garage parking. Dave's Hardbop Quintet will be ready to go on 10/13. Plenty of street, garage and lot parking in the area. This is one of the last appearances on the "deck" for this year. Don't worry about it being too chilly. There's space heaters there to keep you warm and toasty. No cover or admission to hear the hardest working band in NorCal. The Dave Rocha Hardbop Quintet will be pulling out all the stops for this one.